Give your home or business a stunning, new look by allowing our team of experts to bring real appeal to your living area. 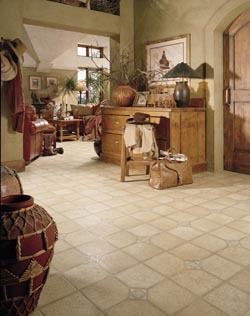 At our flooring store, we have a wide selection of luxury vinyl tile in all price ranges. Our new flooring products offer nearly limitless options that help home and business owners give their floors a stylish makeover. Most importantly, luxury vinyl tile (LVT) is very affordable, so you don’t have to worry about breaking the bank. Using state-of-the-art 3D printing technology, luxury vinyl tile can be manufactured to look like any flooring type: wood, stone, ceramic tile, or porcelain. Incorporating natural colors and different textures, these floors fool even your most observant guests. Allow our professionals to help you select the perfect flooring for your home or business. We ensure you enjoy luxurious floors at an affordable price. Affordability doesn’t always mean versatility. In fact, some affordable floors are not versatile at all, but rather poorly manufactured. However, when you visit us for luxurious vinyl tile flooring, you can always expect discount flooring that caters to your style and preferences as well. Help the environment, save money, and enjoy beautiful floors. LVT has significant advantages over traditional wood or vinyl floors and it is eco-friendly! For instance, the manufacturing process of traditional vinyl tile tends to deplete our natural resources, and types of older vinyl tile contain asbestos. However, today’s luxury vinyl avoids these issues. It is a resilient and eco-friendly product that comes in many varieties. In addition, due to advancements in the manufacturing process, luxury vinyl tile is made in a way that has a minimal environmental impact. For an affordable, attractive, and eco-friendly flooring product, the clear choice is LVT. You just bought your new resilient flooring. Now what do you do? Improve the appearance of your living space by relying on us for professional floor installation. After choosing the pattern, color, and style, our specialists will install your new flooring efficiently and affordably for you. It’s important for any new floor to have a sturdy, level surface. This ensures a long-lasting and quality product. Let us take care of everything so you can have extra peace of mind. We make sure the flooring surface is level, smooth, and clean before installation. The resilient flooring installation is faster and easier than hardwood and tile flooring, it costs less, and it is easier to maintain. Contact us for more information about our special offers. We proudly serve residential and commercial customers in and around Hooksett, New Hampshire.